Wiener Stadthalle is an indoor arena , located in the 15th district of Vienna, Austria . It was designed by Austrian architect Roland Rainer and built from 1953 to 1958 . The arena HAS to overall seating capacity of 16,000 people Approximately . 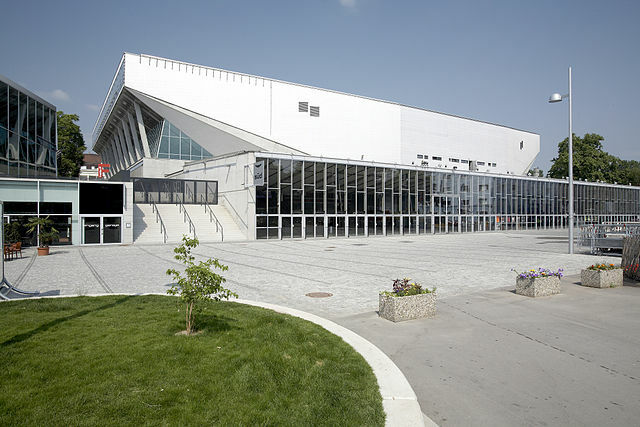 The arena Comprises 6 halls : A and B ( grammar school ), C (ice arena) , D ( main hall , mostly for concerts eg Metallica ), E ( for smaller events eg The Stehaufmandln ) & F ( for more intimate concerts eg Women's World Award). In 1974 , the additional Stadthallenbad , a public swimming pool , which built . The arena hosts annual tennis tournament at , called Erste Bank Open and the show Holiday On Ice. Many famous shows and artists played at the Wiener Stadthalle, spanning many different genres of music .